A Scenario for Aeronautica Imperialis by CyberShadow. This was originally posted on EpiComms the best forum for all your Epic needs. The Imperial reconquest of Rynn’s World was not going well. The 15th Imperial Army under Commissar-General Mordrid Van Horcic had finally broken through the Hellblade mountains after months of fighting against the alien Ork invaders. The battle now spilled into the thousand mile-long Desolation Valley. The Sulphur River that divided Desolation Valley into twhalves was impassable except at a few bridges that remained across it. After more bloody fighting, Imperial Space Marines captured the bridges so that the Imperial forces could continue their attack. Within hours, crude Ork Fighta-Bommerz were hurtling up the valley to try and bomb the vital bridges into oblivion. In addition, the defender is equipped with Hydra ground defence platforms. The attacker received 100 points to spend on aircraft. These points may be spent on fighters and bombers, but at least two bombers must be included. No ground defences may be used by the attacker. The defender gets 75 points which may be spent on fighter craft only, no bombers or ground defences. Ground defences belonging to the defender occur freely and randomly as part of the scenario. Only one type of ground defence is available which is available freely to the defender (generally costing around 8 points each – this is left to the discretion of the players). The board is divided into a number of sections, and played lengthwise – with the craft moving towards a short edge. In additional, there is only one direction of travel (towards a single short edge). this strip impacts against the ravine walls with unfortunate results! Select one short edge as the direction of travel (referred to as North). Determine the centre line of the board, half way along this strip. All attacking craft are first placed within 2” of any point of this line, at any altitude and speed, but facing in the direction of travel. It may be an idea to mark this centre point in some way, such as a length of string, as it will be required throughout the scenario. Defending craft are placed against the opposite board edge (behind the attackers craft, against the South board edge), again facing North, at any speed or altitude. Each turn all craft move along the length of the board. Conduct the turns as normal, with two alterations. This scenario uses a ‘rolling board’. In each end phase, the board pieces are adjusted to reflect the passage of the aircraft along the ravine. In each end phase, if at least one attacking aircraft ends the turn North of the centre line, move the lead attacking aircraft (ie the one closest to the North short board edge) directly back to be placed on the centre line of the board, without moving it laterally East or West at all. Measure the distance that this craft is moved. Then, move every other model (fighter, bomber, ground defence, obstacle, friend and enemy) exactly the same distance South (ie, away from the direction of travel). The board is only ever ‘moved’ in this way in one direction. Models are never moved towards the direction of travel, even if the actual models on the board end the turn to the South of the centre line. Attacking aircraft which are forced to leave the board by the South edge are considered destroyed. Defending aircraft which exit the board via the South edge are held off the board and can be placed in the beginning of any subsequent turn (see below). Attacking craft which manage to exit the board via the North edge may also return to play via the Southern edge, as if they had fallen behind (in reality, they pull up and swing around for another pass). Three additional events may occur at the beginning of the turn, before players select manoeuvres for their aircraft. They occur in the following order. Any defending aircraft which exited the board may attempt to re-enter play. Roll a dice for each aircraft the controlling player would like to re-enter. That aircraft may re-join the fight on the D6 roll of a 3+. If successful, place the aircraft touching the Southern board edge, facing directly North and at any speed and altitude. Returning aircraft may be placed on the table in a tailing position if there are enemy craft within range of the Southern board edge. The ravine is not a totally clear passage for flight, and the river below splits and rejoins, cutting its way through the mountainside. In addition, the defenders have placed strategic defences along the walls of the ravine. The defender rolls a single dice. On the result of a 5+ a defence or obstacle looms in the distance. Roll a second dice. On a 1-3 the defending player may place a ground defence, while on a 4-6 an obstacle is placed. However, only one obstacle may be on the board at any time. If the roll results in an obstacle, and one is already in play, then a ground defence is placed instead. Ground defences must be placed inside the ravine, within 1” of one of the side walls, against the North short board edge. All ground defences are placed on outcrops of the wall, and all are assumed to be based at altitude level 3. Obstacles represent a fork in the ravine, with a towering pillar of rock reaching for the sky. Each pillar is a rectangle, with a width of 3” and a length of 6”, and is placed with its short edge parallel to the boards short edge and its long edge parallel to the boards long edge. Initially, this pillar will be just off the North edge of the board, and will move onto the board in the end phase of the current turn. Roll a dice for placement. 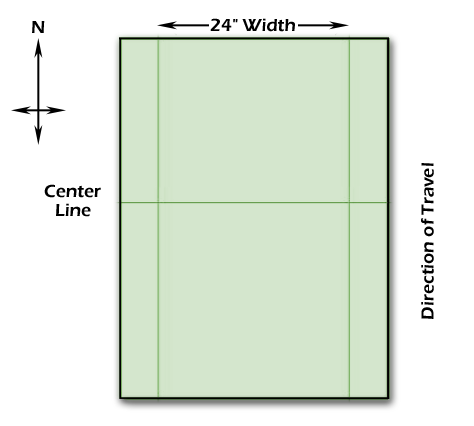 On a 1-2 it is placed with the centre of its short edge 4” to the West of the centre of the North board edge, on a 3-4 it is place directly in the middle of the North board edge, and on a 5-6 it is placed with the centre of its short edge 4” to the East of the middle point of the North board edge. The attackers are attempting to destroy the bridges which run across the ravine. There are three bridges as targets, and they may be targeted by ground attack weapons and ‘standard’ weapons (including aerial attack weapons – so pretty much anything can hit them!). They have a total of 3 hit points (where-ever on the bridges it is actually hit), are located at altitude level 4, cannot be crashed into, and are targeted as normal – except that a specific point on the bridge must be selected as target point. Objectives are placed at the start of the fifth, eighth and tenth turn, and are placed running from East to West, stretching from cliff wall to cliff wall. They are placed on the board, touching the North edge (so, it is possible for an objective and an obstacle to appear in the same turn. Only one thing matters in this game – destroying the vital bridges across the river. If the attackers manage to destroy two, or even all three, of the objectives then they may claim victory for the game – the defenders ability to move their forces around is drastically reduced and the attackers have the upper hand. If the attackers don’t manage to destroy a single bridge then they have had no impact on the movement of the defenders, and simply wasted valuable resources. If one bridge is destroyed, then the result is a draw – the defending forces are hampered in their movement of resources and units, taking twice as long to relocate their forces.